Each year, the INBRE program selects college students from across Nebraska who have the potential to become the next generation of future scientists. This year, three of those students came from UNO. Earlier this year, three UNO students were selected to join 25 other college students from across the state to be a part of the Nebraska Institutional Development Award (IDeA) Networks of Biomedical Research Excellence program, or INBRE. Since 2001, the program has helped expose students to professional levels of biomedical research and helped create a statewide biomedical research infrastructure bringing together undergraduate and graduate institutions to strengthen each institution’s research infrastructure and capacity to conduct cutting-edge biomedical and behavioral research. The students, referred to as INBRE scholars, enter the program after completing their sophomore year of college upon recommendation by their college professors. The students receive a two-year scholarship and spend 10 weeks each summer conducting research on either their home campus or at the University of Nebraska Medical Center, the University of Nebraska-Lincoln or Creighton University. 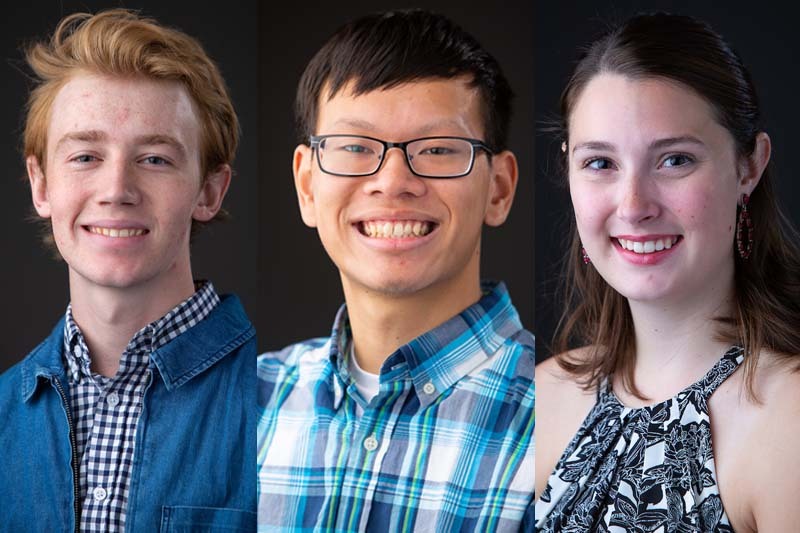 This year’s group of UNO students included Timothy Rezineck, Andrew Pham and Camille Larson. The three Mavericks completed their 10-week summer program by presenting at the annual INBRE conference, where they had the opportunity to share their research with their peers and industry-leading researchers in a variety of biomedical sciences. With the start of the Fall 2018 semester, these new INBRE scholars will join second-year scholars Zohal Alizai, Patricia Harte-Maxwell, Halee Keller and Sean Watson, to conduct biomedical research projects directed by UNO faculty. As a bioinformatics major, Timothy Rezineck has a keen interest in understanding how analyzing large amounts of data can help us better understand ourselves and the world around us. An Omaha native, Timothy was raised on episodes of “Bill Nye: The Science Guy” and, thanks to his exposure to chemistry and enjoyment of video games in high school, he found that bioinformatics combined his interests in computers and physical science. Over the summer, Timothy worked with UNMC’s Shantaram Joshi, Ph.D., who specializes in cell biology and its role in the development of pediatric cancers. Timothy’s work over the summer involved how certain tumor-initiating cells are created and what new options may exist for targeted chemotherapies may be used to treat them. Timothy says that, through INBRE, he has been able to access options he wouldn’t have otherwise had while also going to school full time. When Andrew Pham initially applied for the INBRE program, he didn’t know what to expect. As a pre-med student studying at UNO, the program didn’t exactly align with his expected career path; however, he has already excelled in the program and is eager to become more involved. Coming to UNO from LaVista, Andrew’s interest in science began at a young age and a desire to better understand the world. Andrew, who hopes to pursue his Ph.D., is well on his way after earning second place at the INBRE conference for his oral presentation of his summer research. As the recipient of a 2018 Richard Holland Future Scientist Award, presented by the Nebraska Coalition for Lifesaving Cures, Andrew received a cash prize. Andrew was the only student from UNO to place in the Oral or Poster presentation categories. His research, under the guidance of Paul Sorgen, Ph.D., professor of biochemistry and molecular biology at UNMC, focused on how two adjacent cells are able to form junctions that allow them to pass information from one to the other. He is also thankful for the connections he was able to make with other faculty and his college peers from across the state. A native of Beaver Lake, Neb., Camille Larson was inspired to pursue biology by her parents, Tim and Lisa, who are both science teachers. As part of the summer INBRE experience, Cami had the opportunity to work with Tammy L. Kielian, Ph.D., in her pathology and microbiology lab at UNMC. It was her very first time in a science lab, but it certainly won’t be her last. While at UNMC, Cami had the opportunity to research how our bodies release ‘danger signals’ and whether they can increase risks for Staphylococcus aureus (Staph) infections. Cami recently presented a summary of her research at the INBRE annual meeting. This fall, she hopes to pursue her own research in UNO’s microbiology lab.